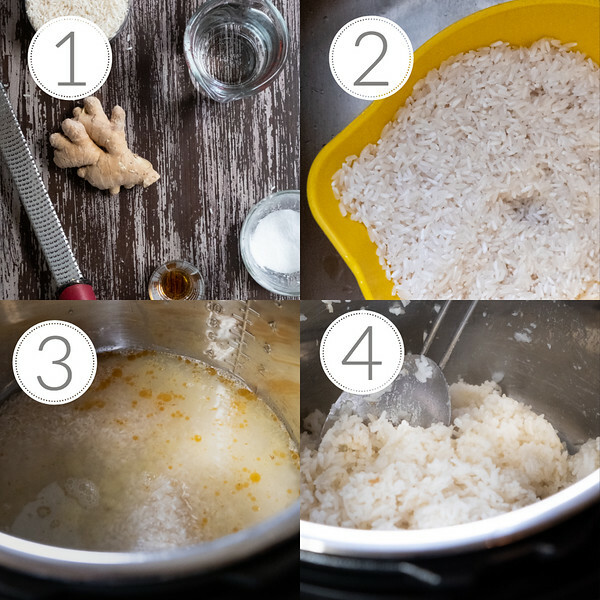 This Instant Pot Sesame Ginger Rice is going to become your go to rice recipe! With only 4 ingredients and so easy to make, there is no need to serve plain rice anymore! 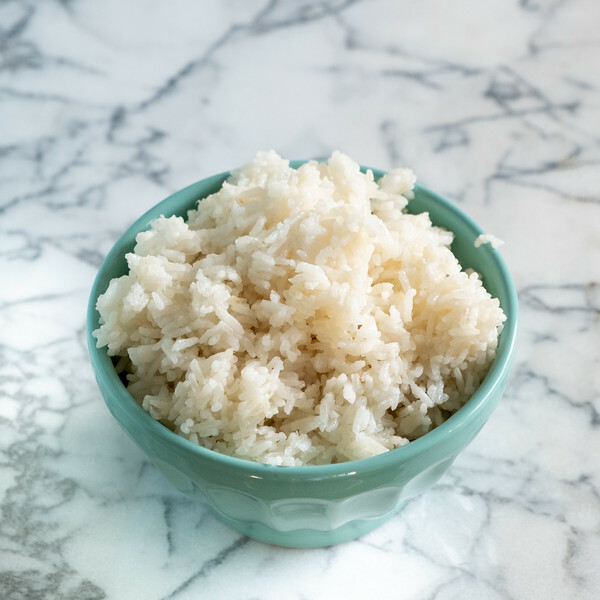 Rice, ginger, sesame oil, and salt are all you need to make this easy and delicious Instant Pot side dish! We make a lot of Asian style recipes, like this Beef and Broccoli Stir Fry, and we serve most of them with rice. We usually use either plain white rice, plain jasmine rice, or plain brown rice. Nothing wrong with plain rice. But then I started thinking about it. What if the rice also had some flavor? Wouldn’t that make the dish even better? Or what about when you’re serving a protein over rice, like salmon or chicken breast? It turns out that it doesn’t take much effort at all to take rice from plain to oh-so-good. It’s even less effort when you let the Instant Pot do the work for you! Step 1 – Gather your ingredients – rice, ginger, toasted sesame oil, and kosher salt. Tip – Store your ginger in the freezer and use a microplane grater to zest it right into the pan. Use Toasted Sesame Oil not plain sesame oil, you want that extra flavor. Rice – any kind of white will work, we especially like the floral flavors of Jasmine Rice. Step 2 – Rinse and drain your rice – this helps keep it from getting clumpy, you can read more about Rinsing Your Rice. Step 3 – Put all the ingredients in the Instant Pot and give it a quick stir. Lock the lid on and set the valve to sealing. Set the pot for high pressure, timer for 3 minutes. Step 4 – When the timer goes off at 3 minutes, let the pressure release naturally (NPR) for 10 minutes. Then turn the valve to venting. When the pressure has fully released and the floating valve has dropped, unlock and remove the lid. Fluff the rice. This has rapidly become one of our favorite pressure cooker Recipes! The Instant Pot Jasmine Rice comes out perfectly every time! We’ve also tried it with regular white rice and it’s also perfect. The flavors of ginger and sesame softly perfume the rice. It is the perfect Asian side dish. It also works perfectly as the base for a stir fry! You can find even more Instant Pot Recipes by following my Instant Pot Pinterest Board! 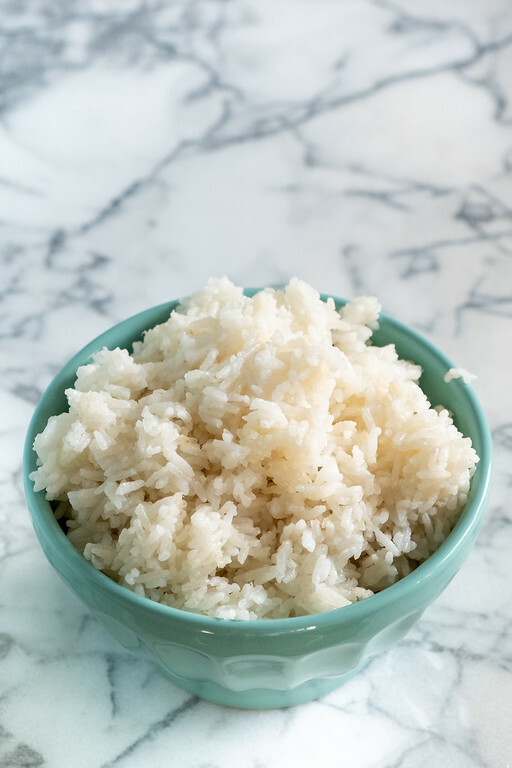 This easy four ingredient Instant Pot Rice recipe is going to become your favorite. Sesame and ginger make a flavorful rice, perfect as a side dish or as the base of a stir fry! Rinse the rice in water and drain. Add water, rice, ginger, toasted sesame oil and salt into Instant Pot. Lock on lid, set valve to sealing. Select High Pressure and timer for 3 minutes. When timer goes off, let pressure release naturally for 10 minutes. Then, turn the venting valve to venting. When pressure has released and floating valve has dropped, remove the lid and fluff the rice. Store your ginger in the freezer and use a microplane grater to zest it right into the pan. Rice - any kind of white rice will work, we especially like the floral flavors of Jasmine Rice. Love the idea of the sesame and ginger flavor in a bowl of rice need to make it in my Instant Pot sounds so delicious and different too. I really loved your ginger tip about putting it in the freezer. Such a great idea. It works so well and you can always have fresh ginger on hand! Wow!! This looks terrific!! My family would really enjoy it!! It looks like a new favorite for weeknights! Adding this to my list! The flavors in this sound awesome. Love how easy this is to make. This is indeed a wonderful recipe. I love the simplicity in it. I am trying it soon for sure. I know! I couldn’t believe I hadn’t either! It’s so easy and it comes out perfect!